Jamie Dallas braced for the jump, pulling in a deep breath. She stood on a fifty-foot rock arch under a massive blue sky, and the exquisite autumn moment was about to get insanely better. “Never.” Dallas ran four steps and leapt off the rock into the thin air. Gravity yanked her down, and she tightened her grip on the cable. Free-falling! A rush of adrenaline pulsed through her body. The moment the rope hit its full extension, she leaned back and pumped her legs. Her body swung wildly under the arch, coming up on the other side. Glorious! She threw her weight back in the other direction and let out a wild cry of joy, followed by an exuberant body laugh. The world’s biggest swing in the most beautiful setting. The closest she’d ever come to flying—except for hang gliding. Or maybe parasailing. But this was better, more out of control. Above her on the rocks, her new friends—technically her targets—laughed and called for her to show them something. Dallas executed a series of aerial stunts, her body bursting with the joy of being upside-down, weightless, and in motion. Damn! This was good. When the momentum died, Luke and Abby pulled her up. Dallas stepped onto the solid rock and grinned. “That was incredible!” Another group of thrill-seekers sprawled on the nearby outcropping, waiting their turn. These people were easy to like, and she had moments when she forgot she was an undercover agent, intent on sending them to prison. She’d been working the case for months, meeting up with the group in various locations around the country to hang glide or BASE jump or some other wild adventure. She’d first met Luke and Abby in Vegas, when a group of fifty people had gathered to skydive for a video stunt they hoped would go viral. The weekend had been a personal adventure Dallas had signed up for online, a quick trip from her hometown. But after the jump, while packing her gear, she’d overheard snippets of the couple’s conversation that made her FBI nerves jangle. The words hack and sabotage used closely together had to be about criminal enterprise, and terminate sounded like they had murder in mind. She’d taken her concerns to her boss in the Phoenix field office, and he’d encouraged her to stay in touch with the couple through their shared thrill-sport passion. Out of habit from her job and a personal sense of fun, she’d used an alias to sign up for the original adventure, so her cover had been established from the beginning. After she learned Luke and Abby were prison-reform activists, the bureau had done the rest by creating a background for her that would appeal to the couple. Dallas unbuckled her harness, and Luke high-fived her. “You rock. You’re officially a Flyer.” At five-nine, Luke wasn’t much taller than her, but he was a bodybuilder with incredible strength, and his compelling face was blemished only by a weak chin. “Hell yeah!” Dallas did a little happy dance. At twenty-eight, she was still allowed. “I don’t know how you get in and out of that safety harness so easily,” Abby said. Luke’s girlfriend was his opposite, with a long lean body and cropped dark hair that made her look even taller. Her delicate facial features bore the pockmarks of an earlier life of drugs, and her eyes held a lifetime of distrust. “I like to keep it interesting.” Dallas handed over the gear. She’d gone on several more adventures with the club, staying close to the couple and their friend Cree. Late-night drinking and gabbing sessions with the group had led her to believe they were targeting politicians who stood in the way of the reform they wanted. After a teleconference with FBI headquarters, the bureau had green-lighted a full undercover investigation, and she’d moved to an apartment in Washington DC to be near where the three lived. They were also members of a national organization called Justice Reform Now (JRN), which was pushing to change drug and sentencing laws and improve prison conditions through legislation and social-media outreach. Her task was to infiltrate the secret inner circle and discover their agenda. 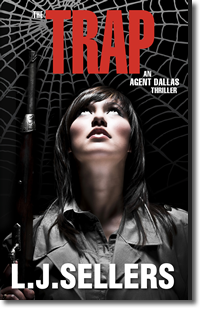 The bureau had given them, and her undercover assignment, the code name Freeman. The activists knew her as Tara Adams, a ghostwriter with a criminal record turned political blogger. She’d kept her hair blond for this assignment, because they’d already seen her that way, but she’d started wearing dark eye makeup and green contacts to change her look. She was still waiting for Luke to ask her to join their cause. “I can’t wait to go again,” she said, buckling Abby into the harness. More progress. This was the second time he’d shown a personal interest. Dallas smiled and laughed. “He thinks I’m crazy.” She didn’t want to alienate Luke’s girlfriend, but to be successful in her assignment, she might have to. Being an undercover agent for the bureau allowed her to put her attractiveness to good use, and seduction was one of her specialties. She was also a sharpshooter, but that skill came in handy less often. Luke, the leader, was her main target, and earning his affection was the fastest way to get inside and find out what they were really up to. A pause while Abby locked eyes with Luke. “Don’t do it.” Abby turned and started for the edge of the arch. Don’t do what? Something was coming down and Abby was against it. Dallas pulled a beer from the cooler, high-fived Cree, and took a seat on a rock ledge. She kept to herself, hoping Luke would come and talk to her after Abby made the jump. Yes! She was in. Dallas worried he would notice her escalating pulse and forced herself to sound casual. “Sure.” The high school acting lessons her aunt had paid for, to keep her busy, had prepped Dallas well for this job. The political science courses in college had been a plus too, when she’d applied at the bureau. Cree walked up, his long braid hanging over his shoulder. “Hey, maybe we should offer Tara a ride back, since we’re all going to DC.” Cree glanced at Luke. A trust-fund kid with a rebel heart, Cree was a pilot with access to his family’s plane. Dallas suspected he also helped fund their excursions. Cree started to respond, then stopped. Later, while waiting to catch her flight back to the capital, she dug into the secret compartment at the bottom of her backpack for her burner phone. This one was exclusively for reporting to Agent Drager, her undercover contact. Two additional agents were on her UC team, but she’d never met them. It was safer for her that way. And she’d only talked face-to-face with Drager once, at a brief clandestine encounter. Going anywhere near the FBI field office or being seen with an agent was too risky. The main JRN group had been operating in Washington DC for years, and Luke was a well-known activist with many connections. Dallas texted Drager: I’m in! Going to a house southeast Fairfax Station on Friday for meeting at five. No address yet. They’re picking me up. As she settled into her seat on the plane, Drager texted back: Good job! Let’s meet tomorrow for an update. Could be our last chance before they isolate you. The words gave her a chill. But that was how activist, cult-like groups functioned and kept members in line. She knew from experience in infiltrating a survivalist compound. She texted: When and where? Drager came back with: I’ll contact you at noon. Be in the downtown area. The plane started to taxi, and Dallas turned off her phone. Her body was tired, but her brain wouldn’t let her relax. Once she was a member of the inner circle, her contact with Drager would be limited. This could turn out to be her most dangerous assignment yet. She might have to participate in illegal activities to win their trust and gather enough evidence for a conviction. If the group found out she was a federal agent, they might kill her to protect themselves. Sometimes her job scared the hell out of her—but that was why she loved it.